Bedroom closets and dressers: Get rid of any clothing item that you no longer wear, doesn’t fit any more or is torn or ripped and cannot be repaired. There is no need to have closets and dressers jam-packed with clothing you don’t wear or can’t wear. Make room for the clothing pieces you love so you can find them easier. Bathroom: Use up or get rid of half used bottles of shampoo and conditioner. If you don’t like their effect on your hair, consider using shampoo for shower gel and conditioner for shaving gel. 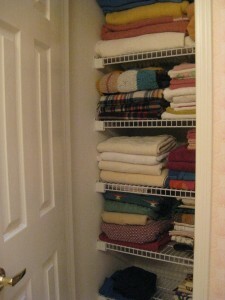 Linen closet: Group towel sets and sets of bed clothes together. Get rid of any mismatched sets. Use frayed towels for cleaning rags in your workshop/garage. Foyer/Hall closet: Give all the things you grab on the way out the door a place of their own by the door so you can find them when you need them and return them to their proper place when you come back home. Make a space in the closet or under a bench for shoes and boots. A circular canister works well for umbrellas. Give the kids a hook in the closet or on the wall to hang their own jackets and backpacks. Kitchen: Clean out the pantry and cabinets. Get rid of any canned goods that are out of date. Throw away stale bags of chips. Sort through dishes and cookware including utensils. Get rid of chipped dishes and mismatched sets. Free up cabinet space by getting rid of extra serving dishes you never use. If you have multiple cooking utensils, keep those in the best shape and toss out the duplicates. Family room: If you plan to sit on the couch, get rid of all the extra throw pillows. It is OK to keep a couple decorative pillows, but there is no need for 10-15 of them. Keep 2-3 pillows that are in good shape and match your décor, but get rid of the rest. Clean out your media cabinet and get rid of CDs and DVDs that are scratched or broken or that you no longer us. Recycle the plastic cases. Mail organizer: Designate a space in your home to place your mail until you have time to go through it whether it is on the kitchen counter, an entry table in the foyer or in your office. You’ll always know where to find the mail. Office: Organize files in a meaningful way from phone and electric bills to health records and receipts and warranties for appliances. Create a filing system that works for you, i.e. arranging files by color file folders or alphabetically. Playroom: Eliminate broken toys and those with missing pieces. Recycle anything you can. Put game and puzzle pieces back in their respective boxes or containers and stack them in cabinets or on shelves. Get rid of toys the kids no longer play with. If they are in good condition, donate them to charity. Laundry room: Establish a sorting procedure for sorting laundry by arranging labeled baskets in the laundry room. Teach your kids to sort their own clothing. Garage: Sort everything in the garage and group like items in storage tubs. Get rid of broken toys and bikes that have been outgrown. Securely store power tool and hazardous chemicals out of reach of children.